Siemens Ltd, the Indian subsidiary of Siemens AG, has performed relatively better than its peers in the past year. This is the reason its shares have been rather resilient, even after the parent company’s open offer to minority shareholders for a 20% stake closed in April. It now appears that even Siemens is beginning to feel the pinch of the slowdown in industrial activity and the pressure on margins. The drop in the firm’s financial performance has been gradual, beginning in the June quarter. In the first six months of the fiscal year (Siemens follows an October-September accounting period), revenue had risen by as much as 37% and Ebit had increased by 23%. What’s more, adjusted for a big order received in the year-ago period, order intake had risen nearly 50% in the first half of the year. In the June quarter, growth in order intake fell to 16%. Similarly, revenue growth fell to 24.5% and Ebit fell by 7.6% owing to pressure on margins. So, it’s not that the Street didn’t see it coming. Still, the drop in order intake in the September quarter and the sharp drop in profit have come as negative surprises. The pressure on margins seems to be getting worse and the impact on demand because of high interest rates and the industrial slowdown also seems to be worsening. At first look, it appears that investors have taken the poor results in their stride. 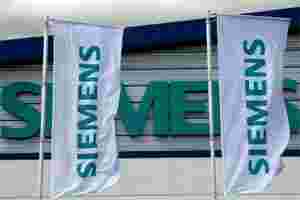 Siemens’ share price fell by 2.5% on the National Stock Exchange on Wednesday, more or less in line with the drop in the Nifty index. But note that this was preceded by a 10-day period of heavy losses for the stock. Since early November, the stock has lost nearly 21%, much higher than the 11% drop in the Nifty. Despite the recent underperformance, Siemens investors continue to be much better off relative to peers. On a year-till-date basis, its shares have fallen around 16%, while the BSE capital goods index has dropped by over 41%. Needless to say, for the company to maintain its lead, it will have to get back to its healthy order-winning ways.